Most of my daily commute is a single road that varies between 45 and 50 miles per hour. The other day, both going to work and coming home, traffic was thick but not heavy. It was also moving more slowly than usual. Apparently it was “Drive 5 MPH under the limit day” and no one had told me. Now: I admit I have issues with driving and traffic. During Lent a few years ago, my main focus was to improve my attitude while driving. I’ve come a long way. I’ve come so far that this year, on National “Drive 5 MPH under the limit Day” I didn’t get mad. I realized that the posted speed limit is not a requirement. 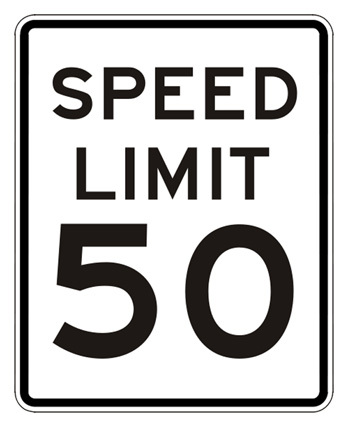 One is not required to drive 50, for example, just because the speed limit is 50. It just so happens that I am almost always in enough hurry to get to wherever I am going next that I push the limit. Yes, I admit right here on the internet that I regularly drive a little above the speed limit. Some people think limits are made to be pushed. I tend to be one of those people. quit stressing yourself out by setting yourself up for it when others don’t believe in pushing the speed limit. They are actually following the speed limit law, which is posted at that particular place for a reason… if you are in such a hurry, start earlier.